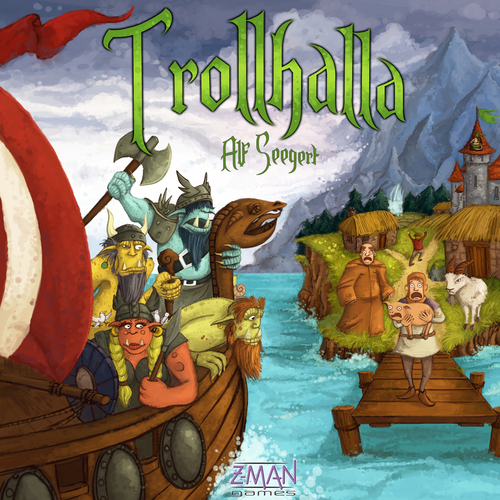 Trollhalla is one of those games that looks deceptively simple. There are three ships sailing to seven islands on the game board. On their turn, players will place their trolls on ships and roll a die to move to another island to capture the plunder on that island. The six different types of plunder include; crunchy goats and cows, panicked princesses, terrified monks, noblemen, and peasants with pigs, piles of gold, and casks of grog. Points are awarded for the plunder each player captures. Bonus points are awarded for having the most of one type of plunder and having one of each type of plunder. Cleverly designed, plunder with low points per each have high points when collected as the largest set of that type. The infamous goat plunder offers no points per each, but has the largest point value for the largest set of its type. And, the goats go crazy on board your boat and kicks off one of your other plunder tiles. Just to make things more interesting there are spaces between the islands where players can place trolls to influence the direction a ship will sail. These spaces also yield weather cards. These cards can be used to place an extra troll, scatter trolls from routes and even turn a ship upside down to get your trolls in the right spot to grab the right plunder. When there is not enough plunder to refill an island the game ends with the evilest plundering troll who gained the most points wins.